Several weeks ago, while discussing the oncoming winter with my Southern-raised girlfriend, we reached an impasse over what exactly constituted weather cold enough to get alarmed about. Coming from Louisiana, she insisted that anything in even the 40s Fahrenheit was frigid, weather to cause people to stay indoors, bundled up in front of the fireplace. Myself, growing up in bitter Chicago winters, said you can’t start calling weather “cold” until the weather at least falls into the 30s — and that even then, extreme cold doesn’t start until the thermometer falls to the single digits. But clearly our perspectives were entirely subjective. The only way out of this situation, for any good rationally minded person, is to get more data. The warmest temperature anyone considered cold was 62, though that may be an outlier — that respondent gave a range of only 11 degrees between cold and hot, much less than the average. Next up was 55 degrees, from a southerner. The coldest temperature that anyone considers not cold was a mere 11 degrees, from someone raised on a farm on the central South Dakota prairie. The coldest temperature anyone considered hot, aside from that same outlier (who said 73) was 85 degrees, while the highest threshold for the onset of true heat was 97. One person commented, “I think that you’ll find that the survey results will show that women get colder at a much warmer temperature than men.” And, in fact, he was right. The median female respondent said coldness began at 45 degrees, while the median male said coldness didn’t begin until 32 degrees. (Means told a similar story.) This wasn’t a function of a sample including a lot of females from warmer climes — the median latitude was about the same for both genders. But there was no difference when it came to when hotness began. Both men and women had a median hotness temperature of 90 degrees. Indeed, there was remarkable agreement about what constitutes heat. 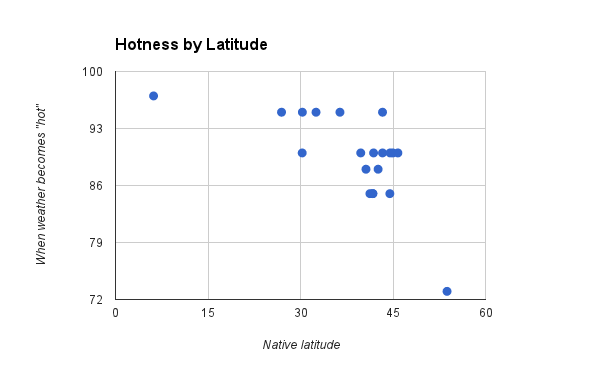 Setting aside the outlier, the range of hotness answers varied by only 12 degrees. 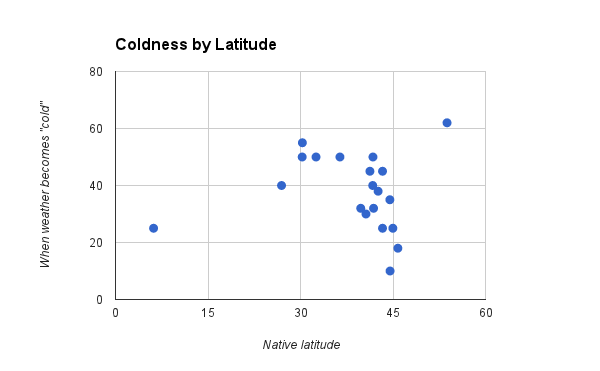 The range of coldness answers varied by 45 degrees. This study didn’t actually end up proving anything or resolving my debate with my girlfriend. (For one thing, I’d prefer to have a sample size of several thousand points, not just a score.) But I had fun doing it, which is really the point of [social] science. Interestingly, in our conversations, my girlfriend and I have agreed that the extremes aren’t actually where people disagree. That is, when it’s 102, everyone agrees it’s really hot, even if some people are more bothered by it than others. The same when the weather hits single digits — everyone agrees it’s really, uncomfortably cold. The conflicts arise in the middle ground — whether it’s warm enough to open the windows, or cold enough to require a comforter on top of bed sheets.